Thirty eight states grow blueberries commercially. However, ten states account for more than 98 % of U.S. commercial production: California, Florida, Georgia, Indiana, Michigan, Mississippi, New Jersey, North Carolina, Oregon and Washington. 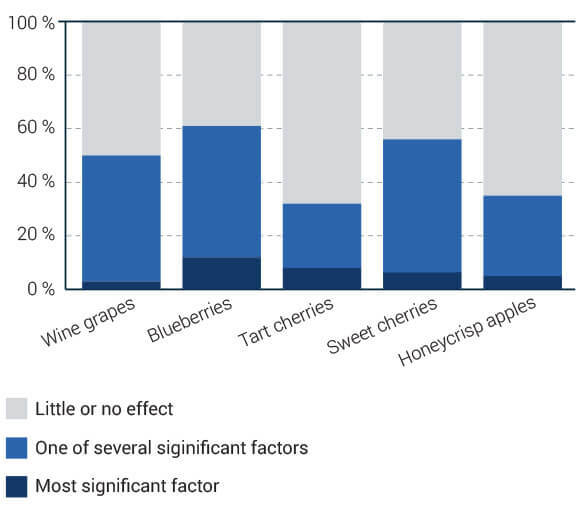 The U.S. Department of Agriculture National Agricultural Statistics Service reports that American growers lose tens of millions of dollars each year as a result of bird nuisance and ineffective bird repelling methods (research was limited to two crops and seven states).2 The research “Bird damage to select fruit crops: The cost of damage and the benefits of control in the following five states: California, Michigan, New York, Oregon and Washington.” estimated that the current bird damage costs per acre ranged from 42 USD in Oregon tart cherries to 2,942 USD in Washington Honeycrisp apples.3 The blueberry crops suffer most from the bird damage. The bar chart “Impact of bird damage on the profit of the farm” demonstrates the growers’ qualitative assessment of the effects of bird damage on profit. Oregon and Washington have the biggest blueberry crop damage caused by birds per acre. 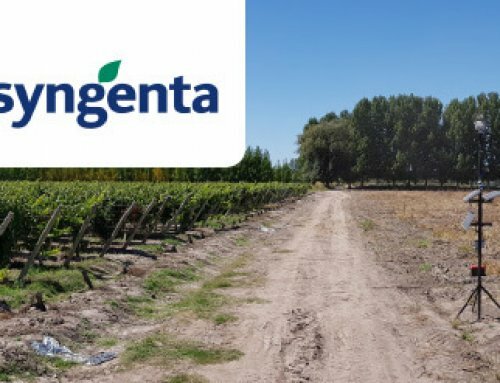 The damage per acre for blueberries equals to 1,851 USD for Oregon and is calculated at 11,238,095 USD for the entire state. The table “Bird damage per state” demonstrates the bird damage in fruit production per hectare/acre and statewide. 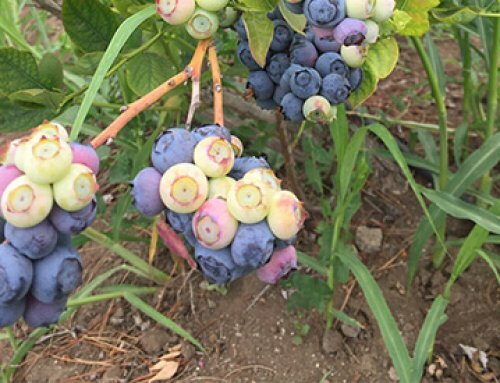 The birds that are responsible for damage to blueberry crops in the researched five states include American Robins, European Starlings and Blackbirds. * This category could include one of several bird species including the red-winged Blackbird, Agelaius phoeniceus, or potentially misidentified European Starlings. The data illustrates the significant impact bird nuisance has on farming and, specifically, on fruit industry, which is an important sector of the U.S. economy. Many farmers have been unable to successfully resolve this problem, as they were relying on inefficient bird deterrence methods. Through innovative processes and strong customer, employee, and supplier relationships, Meduri Farms is committed to being the premier infused dried fruit producer in the world. Innovation is a very important aspect of any business and as such, Justin Meduri, Farm Operations Manager at Meduri Farms, is always on the lookout for innovative and cost-effective bird repellent solutions for their blueberry farm. 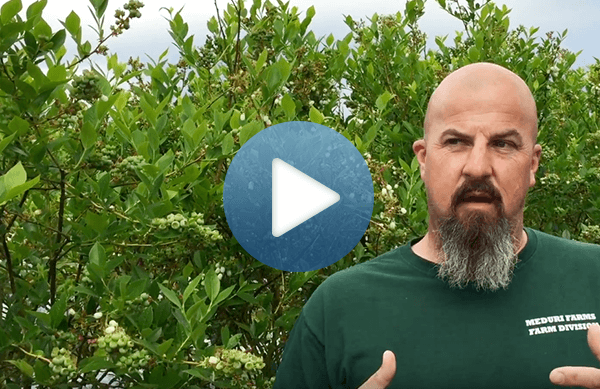 When Justin started looking for a more effective bird repelling solution, he discovered Bird Control Group. He was intrigued by the possibility of the automated laser bird deterrent system, and requested a demonstration of the Autonomic. During the demo, Justin immediately had great results and he went for a long term lease of 6 Autonomics. “It has been a success story ever since,” he says. 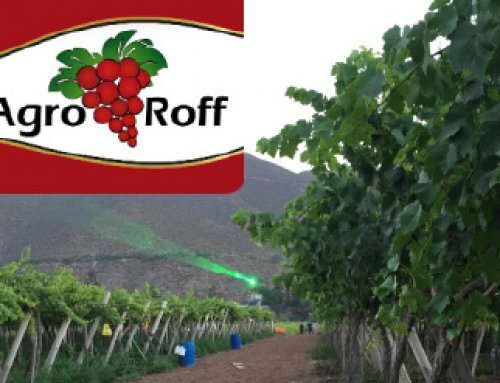 Laser bird deterrent technology takes advantage of a bird’s natural instincts. Birds perceive an approaching laser beam as a predator and take flight to seek safety. “This is so much better than scaring birds with falcons,” says Justin Meduri. “We had to work so hard to keep the birds away. Last year, it was one of the years with the highest bird damage. 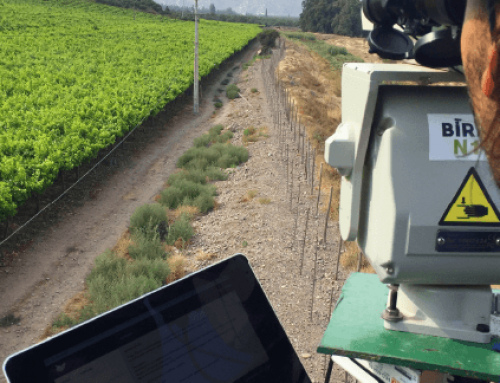 We had a lot of birds in the farm; now with the Autonomics we don’t even have to worry about it – we simply have no issue anymore.” A few months later Justin Meduri got 3 more laser bird repellents to fully protect his blueberry farm. First, birds land on the blueberry bushes which shakes the tree and makes the blueberries fall off. Second, birds eat the blueberries and move around in the bushes causing more blueberries to fall on the ground. Third, when birds take off, they shake the branches, causing more blueberries to fall off. Meduri Farms used falconry which cost 1,000 USD per day (approximately 90,000 USD per season of 3 months). The yearly loss to bird damage was equal to 100,000 USD. The actual revenue after bird damage was 300,000 USD per year. Yearly production of the farm before Autonomic use was equal to 787,500 kg. 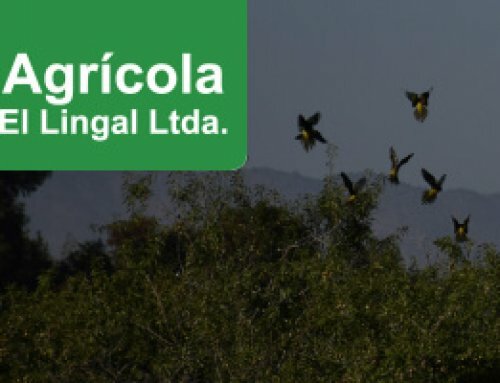 Yearly loss due to bird damage has been reduced by 99.73 % to approximately 267 USD. Actual yearly revenue after bird damage increases by 33 % to 399,733 USD, which means Meduri Farms saves up to 99,733 USD each year. Yearly production of the farm after Autonomic use is equal to 1,050,000 kg. The blueberry varieties produced at Meduri Farms are Aurora, Drapers, Liberty, Legacy. They all mature at a different time during the season. 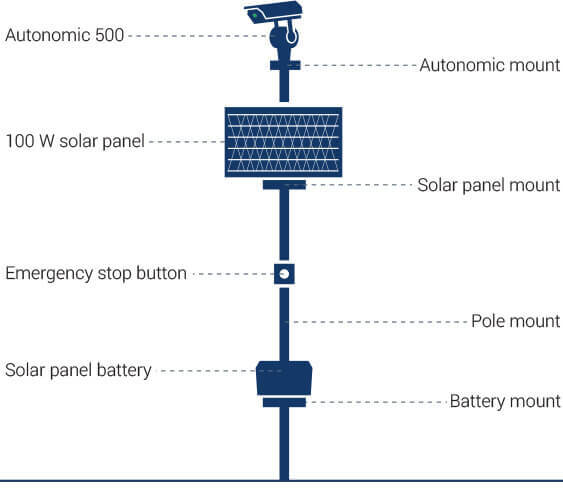 Therefore, the Meduri Farms’ Autonomics are powered by solar energy and installed on a movable pole system. The adjustable pole mounting system allows for the repositioning of the laser devices throughout the farm. In this way, the Autonomics can be moved from the early ripening blueberries to the later ripening blueberries. This results in optimal bird deterrent based on the level of bird activity in various sectors of the farm. Justin is very encouraged with the success realized at Meduri Farms, and is planning to place two more lasers into operation to cover additional areas of the farm.